Tennessee-Tombigbee Waterway, provided of course, you can resist the temptation of it beckoning you farther. are Guntersville, Wheeler, Wilson and Pickwick. 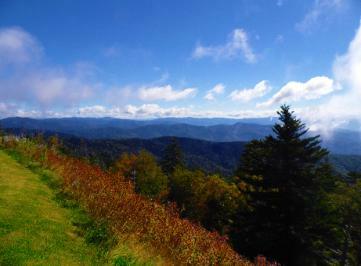 highest Peak in the Great Smoky Mountains and National Park. The Tennessee River runs through Kentucky Lake. This shows one magnificent reason to cruise the Great Loop by the seasons! You will arrive here in the colorful peak of Fall. We're not the kind of person to bury our treasures - We share them. you plan to cruise the Tennessee River to Chattanooga and Knoxville, don't close your eyes to where you are. . .
location of Clingmans Dome which is 6,643-feet up in the clouds. 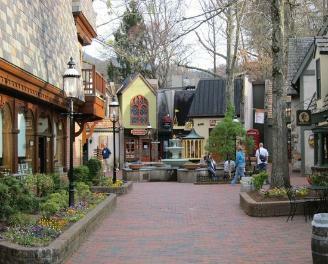 It is especially stunning in the Fall - right when you will be there! with a fireplace and large unlimited hot showers and baths! money. In fact, since we discovered it, we've made it one of our 'for sure' don't miss repeat stops on the Great Loop. America's Great Loop is so amazing! and the Great Smoky Mountains. River at the peak of Fall Foliage.